I spent last weekend at the TNNA show in Phoenix. I was looking at products to review and yarns for the Yarn Tasting at our meeting next July in San Diego. It was a very positive trip. Now I just have to sort through everything I brought back. I came home to several lessons to review and more have arrived each day. I think everyone has recovered from the holidays! This week's tip is fairly self serving. I didn't have much time to think about what to do so I selected a topic based upon something I had done in the project I was working on for Cast On. I designed a skirt which is tight across the hips and then flares out. To separate the two sections I worked a welt. I've used this technique several times. It can be quite decorative but it is a bit tricky to work. You have to have a good understanding of stitch anatomy. A welt is basically a horizontal fold in your work. To work a welt you knit the rows you wish to fold. You then knit the stitch on your needle with a stitch several rows below. It is helpful to mark the row below before beginning. You will be looking at that row from the wrong side which can be confusing. What you want to pick up from the row below is the stitch itself, not the space between the stitches. (Remember, in reverse stockinette, the stitch looks like a frown and the space between looks like a smile.) In the photograph below I have marked the stitches I am going to work with fancy safety pins (I got these at TNNA. They are from Hiya Hiya.) Since this photograph is positioned with the cast on edge at the bottom, the frowns are marked. In this photograph the cast on edge is at the top. Notice that it looks like the safety pins are marking the smiles. You can see why this can be confusing. To work the welt, you can either insert the right needle into the stitch on the left needle and then insert it into the stitch on the row below and then knit the two together. 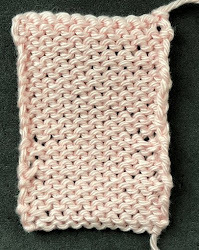 You can also use the right needle to lift the stitch on the row below and then knit them together. Either way works. Salon will be on Sunday from 2-4pm. Come and see my haul from TNNA before I ship it all off to Ohio. I finished up the sweater before going to TNNA. I love this yarn. It is Mrs. Crosby Hat Box. I stopped by their booth at TNNA to thank them. I finished up the skirt on the flight home from Phoenix. I still haven't woven in the ends but I did finish the waist band. All I have to do is write the pattern. (Notice the welt.) The yarn is from Anzula. It is a linen and silk blend, perfect for a summer skirt. Thanks for the post. Be sure to put those projects on your project page. I love the sweater. Glad you like the sweater. I will post these to Ravelry when the magazine is published which won't be until May.